David and Mike navigate the minefield of email, sharing strategies and workflow tips to help you curb inbox addiction and reclaim your focus. Thanks for the shout out @mikeschmitz! Great episode, but fortunately I can’t relate to the issues people have with email: I don’t really get many emails, even at work! That said, I still got a lot out of this episode. One of the easiest ways I started to clean up my email inbox is by waiting for the next email and decide if I still need to get it - most of my emails are from newsletters or brands sending me updates. My work primarily uses Slack, which can be worse than email. It’s way easier for people to message you and expect a quicker reply - it’s a chat + you get notifications. It’s super easy to goof off in it. Lately I’ve been closing my Slack tab when I am in “deep work” mode. I also reply to “update” kinds of message way less. There was a thread a while back about favourite automations and I forgot my best one, which is so, so simple for separating work and personal email. I’ve set up a rule in my work email on the server to send all email to a folder called _myInbox. That way, in Mail.app there are no indicators to show I have unread work email (I never saw an option to disable the count), but I can still send email from the account, which is useful on iOS as you can’t set the default mail app. This allows me to use Mail.app for my personal email, and Outlook for work. My work primarily uses Slack, which can be worse than email. This is a really good point. Slack is not the focus cure for email unless expectations are set accordingly. It can be more efficient because everything is in line and conversation can happen in real time, but it can easily evolve into something else you feel compelled to check all the time. Sometimes the tool isn’t the problem - it’s how we use it. I archive all my emails. Not because the emails are precious (the vast majority are not) but because my time and attention are limited resources. Having only one outcome for an email (archive) is one less decision, one less second spent dealing with each email. Storage is cheap and I’m nowhere near the maximum on my accounts. I’m done with it? Archive. In a similar vein, I don’t have any separate system for reference material or cold storage. If I need to find an email later (and unlike David, I do need to find stuff on a fairly regular basis) I search for it. For my purposes, at least, I’ve found the search features in modern email systems to be good enough that with some good search fu I can dredge up what I’m looking for. I do find that for gmail and Office 365 the search in the web client is the most powerful. Search in Spark (iOS and macOS) and the PC version of Outlook is pretty good. Search in the Apple Mail app is not, particularly on iOS. Great point! My issue is with the bulk application of “I got it” emails. One-on-one It makes perfect sense to me because of the transfer of responsibility, but sometimes I don’t care (and don’t need to know) if the other 25 people on the thread received it or not. And if there’s that many people on the thread, you’d need a running checklist to know when to let it go! An underlining theme of this podcast is developing a communication plan for each of your interactions and achieving an enforced community standard that for each. A relationship will likely stumble when there is not a mutually agreed upon communication protocol or communication occurs outside the parameters of the protocol. Many of us struggle with email overload, but there are also many different kinds of email overload. I’m a journalist, which means that several times a month I get an email indicating a story I need to drop everything to work on right away. I also get emails from colleagues requiring immediate attention. Shutting down all my notifications and only checking email a couple of times a day isn’t an option for me. I might miss something urgent. My solution is to first create filters that move low-priority messages to a secondary inbox. That takes care of about half my mail. Then for the rest I have ALL the alerts switched on. The alert simply exists to tell me whether the email requires my immediate attention. Most of the time, the answer is no it does not require immediate attention, and so I glance at the alert, then go back to what I was doing and ignore the message. If it’s both important and urgent, then yeah I drop what I was doing and jump on it right away. I batch-process low-priority emails. I try to do that once or twice a day but realistically I only get it done a couple of times a week. And that’s OK.
Email needs more AI to prioritize messages for us. I’ve tried SaneBox and the Microsoft Outlook focus feature, and neither one of them is particularly effective for me. If I need to work over the weekend (like I am today), I work in off-line mode so that colleagues (especially those who work for me) don’t see those emails until Monday morning. Yes, it’s obvious what’s happened when 20 emails go out all at once, but there’s no expectation of a response until the business day. During the day, I will often get all of my email, then put the email client in off-line mode and process. That way, I’m not distracted by anything that’s come in while I’m processing. I’ve been trying to set the culture in at least my team that if something requires a response in less than 4 hours, you need to text or go by the other person’s work area. Email is OK for the additional info (I just sent you an email with details, but HQ needs this response in the next hour), but not for notification. The other way I’ve done this is to move all of the inbox into a “to-process” mail folder, then set my focus to that folder, with the inbox scrolled off the top of the list. That does allow me to send emails immediately and take that delay out of the response time cycle. I’m not aware of any iOS email app that supports this sort of off-line mode, short of putting the whole device into airplane mode. I’d love any insight that direction. And bummer that there’s no way for me to use Sanebox. I work in a corporate environment where such things are an absolute no-possible-way. It’s actually not possible to get to our email (even to get the headers) from outside our network. So, email rules seem to be the only way to handle this, and there’s no equivalent to the bcc 1week@sanebox trick. Would love to hear any ideas around that, as well, for something that can be locally installed on a Mac (or even Windows) box. I went in to Airplane mode and then went into my inbox, tapped on an email, tapped reply, wrote something, then tapped Send. It was sitting in the outbox waiting for me to reconnect. Once I turned off Airplane mode, Mail.app sent the email. Does this not meet your needs? Oh! Perhaps not because you’d have to stay in Airplane mode all weekend? I can see where that would be a problem! On the Mac offline mail is for the app. For iOS you need to keep the device offline. So yesterday I tracked every e-mail. It was a typical day for me. 97 potential spam emails caught by Spam Sieve. 20 emails automatically sorted into an ads and news folder that I can choose to read or not as time and inclination permits. It’s for things like coupons and stuff that I want if I need to get something from that store but otherwise don’t want cluttering up my main view. Things get there through a large number fo rules in the mail app. 62 possibly good emails I had to deal with. Of those 5 were actually spam and got deleted. In my spam email uncharacteristically they were all spam. Usually I have 1 or more false positives even after many years of training spamsieve. I spent half an hour handling email and at the end I still had 18 messages in my inbox that I didn’t get to yet. As of this am I’ve gotten another 41 spam of which 1 was not spam but flagged as such, 10 went into ads and news, a quick glance and I was able to delete all of them, 14 good messages of which 5 turned out to actually be spam. One thing I learned from this episode has transformed the way I use email at work. Before I used to always have email open and it would often distract me from more important things. But now I limit my time to at most 1 hour a day. I set a time for 30 minutes in the morning and 15 minutes after lunch and 15 minutes before I leave the office. The rest of the time email is off. I only had to make one change, I setup a special filter to get email from some key people, so I get alerted of that. Most of the time this doesn’t happen outside my designated email time, but occasionally an emergency will pop up and I’ll deal with it. I’m just amazed at how much more focused I am without the constant distraction of email. The other thing is, I’m able to deal with all my email in just 1 hour, often less than that! If you want to download rules similar to the 4Ds Mike mike mentioned, I have some similar Inbox Triage rules I put together. I’m hearing very positive noises about the currently in beta/stealth Superhuman mail service, so much so it’s making me excited about email again. I enjoyed listening to this episode. Sharing some of my writing on the same. Let me know if they are helpful. How to use email as a tool. 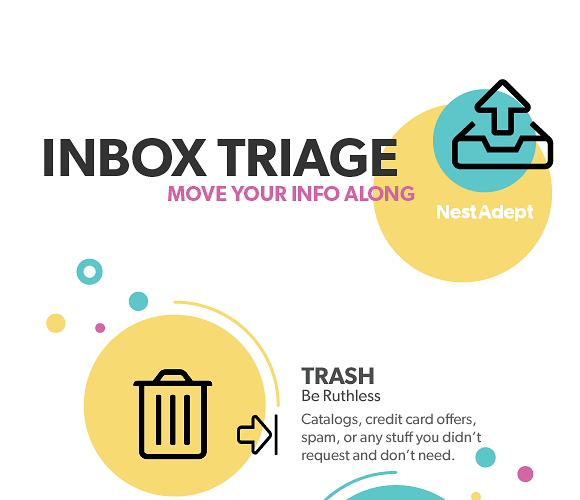 Best practices for using email.